The Ministers of Health and Environment of Gabon open the historic Third Interministerial Conference on Health and Environment in Libreville. In her speech, the Minister stressed the relevance of the link between health and the environment, stating that "environmental risks are a public health issue". 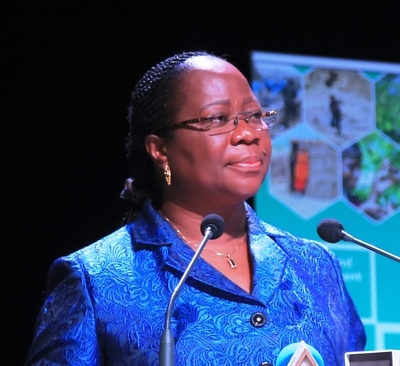 She reminded delegates of the objective of the Inter-ministerial Conference on Health and Environment which is to address the major challenges facing African countries in terms of restoring and preserving the environment for better health. She also mentioned the theme of the meeting, namely Addressing the experts meeting which is taking place for the first two days of the conference, she hoped that participants will share experiences and lessons learnt in health and environment governance in Africa, identify emerging health and environmental issues and threats and options for a healthy environment for people in Africa, as well as highlight the economic cost of environment-related health problems and the value of addressing them to promote the sustainable development goals. She stressed the need to strengthen stakeholder dialogue at the regional level as well as public-private partnership on key health and environment issues, and adopting a strategic programme for increased coverage of health and environmental interventions for primary prevention in public health and ecosystem conservation. Finally, she stated that the recommendations resulting from the work will enable her and her ministerial counterparts to adopt and develop a roadmap for achieving sustainable development objectives. • adopt a strategic programme for increased coverage of health and environmental interventions for primary prevention in public health and ecosystem conservation. Finally, she stated that the recommendations resulting from the work will enable her and her ministerial counterparts to adopt and develop a roadmap for achieving sustainable development objectives. 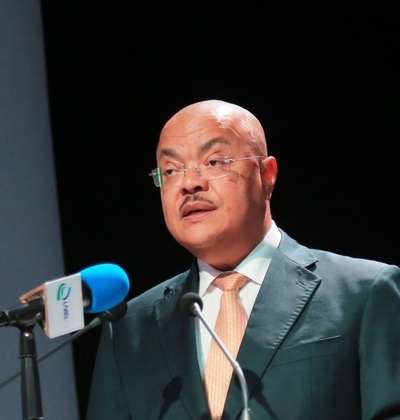 Jacques Denis Tsanga, Minister of Water and Forestry, in charge of the Environment and Sustainable Development of Gabon, started out by welcoming the participants to the conference. He then recalled the motivations that had led to the Libreville Declaration in 2008. "The Libreville Declaration was motivated by the more than 23% of deaths in Africa, or more than 2,400,000 deaths per year, that are attributable to preventable risk factors relating to environmental degradation which in particular affects the poorest, and most vulnerable," he said. Minister Tsanga went on to indicate the steps taken by his country to comply with the provisions of the Libreville Declaration. He pointed out that Gabon has started strengthening its system to monitor of the impact of health and environmental and to identify emerging risks in order to better manage them. This is done through the project entitled, "Integrated health-environment monitoring and strengthening of the legal and institutional framework for the sound management of chemicals and hazardous waste in Africa". Finally, recalling that Africa "remains the continent that is increasingly exposed to natural disasters linked to climate change", he called for the search for "multiple and easily financeable sustainable solutions to enable current and future generations to live in a healthy environment". The momentum built in Libreville in 2008 catalyzed an unprecedented intersectoral and multistakeholder dialogue, bringing a new and dynamic impetus for intersectoral coordinated actions. The establishment of the Health and Environment Strategic Alliance (HESA) acts as the basis of plans of joint action and a regional platform for intersectoral dialogue. Copyright HESA 2018. All Rights Reserved.